After nearly 2 years walking with the BW’s, this weekend I was finally brave enough to lead my first walk. After waking up on Saturday morning and finding it raining, I thought this may put people off coming walking. 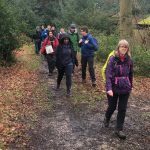 Little did I know the weather would ease and 17 people (including myself) would join me on my first successful walk from Midgham Station as a walk leader. It was great to see some new faces on my walk. We negotiated a short sharp hill at the start which got people’s heart rates up! 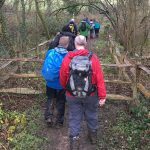 We meandered our way along some beautiful (some slightly muddy) footpaths through the Berkshire countryside and made our way up to Chapel Row near Bucklebury. Once we arrived at Chapel Row the group had a choice….Pub or Cafe!? (Giving options is always a difficult decision for some people in the group). 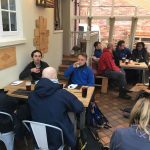 Here the group were to split with some enjoying a cold pint while others enjoyed a hot chocolate and a slice cake! 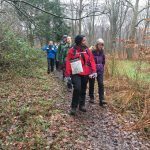 Once fully refreshed with beer and cake we started heading towards Bucklebury Common to start our trek back. Strolling through the woods we could see the bluebells starting to arise from their winter sleep. If this walk was in a couple of months time the woodland floor would have been a carpet of beautiful blue flowers. 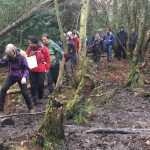 As usual for one of our wintery walks we came across some wet and muddy areas which this group of hardy walkers negotiated excellently! There was a couple of screams and squeals as a boot or two disappeared for a second into a black muddy whole but overall sucessfully negotiated with not too many wet feet. Finally, once arriving back at the start, in great BW tradition we headed off to the pub (again). After saying goodbye to a couple of people we headed off with our muddy boots to The Rowbarge pub for another well earned drink. Here we all huddled near the open fire and chatted about the walk and discussed about the exciting activities/trips the group has coming up this year. I have learnt so much over the last couple of years as a Rambler with the BW’s. Listening to other walk leaders and how they lead walks, I didn’t realise how much information I had taken in. 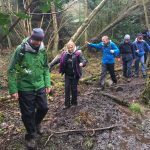 With having the leadership days, map reading walks and map social events these all helped me with gaining my confidence on how to lead my first walk. I’m now busily scouring OS maps looking for where to lead my next walk! 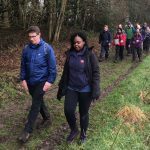 If you haven’t led a walk yet…speak to other walk leaders who have and they can help you with organising your first walk. They will even help you reccy your first walk! It’s such a great sense of achievement knowing that these people on your walk have come along firstly because they want to go walking, meet people and socialise (and likely go to a pub or 2). Thank you to everyone who came along and I’m sure I will be leading a walk in the not to distant future! This entry was posted in Walk Report by Website Manager. Bookmark the permalink. Next → Next post: Why don’t we just put our litter into the bin?